Tyler Herman and Josh Knapp can deal all day and against any team. 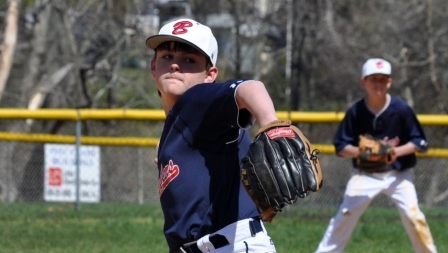 Herman threw a complete game shut out Saturday in Game one of the Ocean County Slug-fest Tournament. He only allowed two hits and two walks while striking out three. 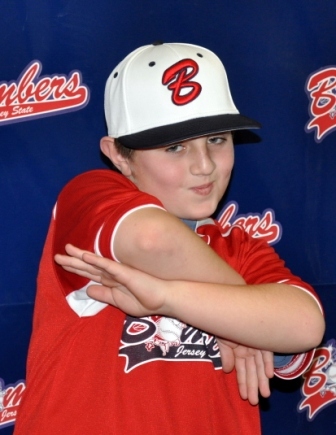 Josh Knapp threw six scoreless innings in game two of the Ocean County Slug-Fest. Knapp posted six strike outs while only allowing two hits and one walk. 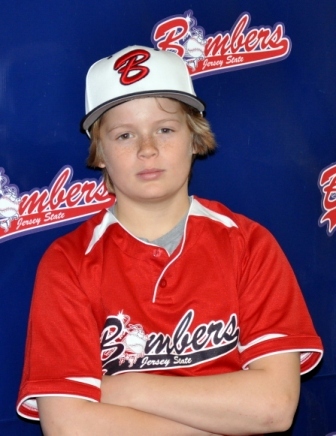 The offense didn’t exactly help the situation which is why the 13U Bombers Blue went 1-1 in day one of the tournament. Mike Christopher is ripping the cover off the ball for 13 Blue. He is leading the team in several different categories. His team high’s are in AVG. .462, Hits 12, Doubles 4, On Base Percentage .588, Slugging Percentage .615 and OPS (On Base-Plus-Slugging) 1.204. Christopher’s mental approach at the plate is really paying off. He is confident, swinging at the right pitches and he is relaxed, which are the top three things in having a great mental approach. Way to go Slugger!!!! 11-U Blue’s Nate Liedtka has been powering up as of lately. He has an astonishing 5 home runs in his last 8 games. The season stats show that the slugger’s doing his job as a middle of the line up hitter. Liedtka has a .457 batting average with 3 doubles, 5 home runs, 17 RBI’s and an impressive .846 slugging percentage. 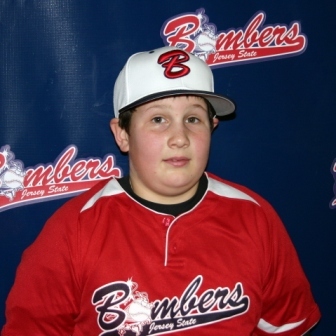 “Liedtka has definitely been a big contributor to the team’s 137 runs scored for the 14-5 Bombers. We are happy to have him on our squad and we look forward to every time he gets up to bat”, said Coach Murray. 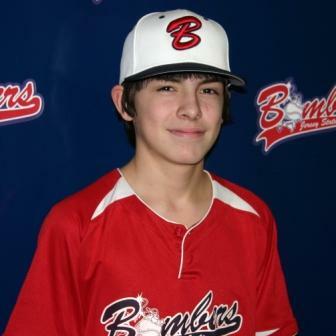 Matty Christopher blasted two home runs on Saturday May 5th to help the Bombers get their 7th straight league win against Next Level Baseball. Christopher, just like his brother, leads his team in several categories. Matt’s team leading categories are his .489 batting average, 7 doubles, 6 home runs, OBP .593, SLUGG 1.021 and Cockiness when he hit’s a bomb 9,999,999,999,999. 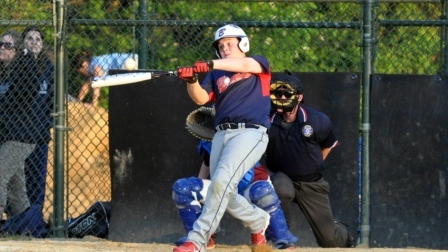 Ryan Feig also hit his second homer of the season on Sunday, May 6th. Feig carries a .419 average with 2 doubles and 2 home runs on the season. Ryan Graham is also lights out on the hill. He is keeping the ball down and striking out hitters at will. “When we need to shut the door on the other team, Ryan is the man for the job.” said Coach Murray. 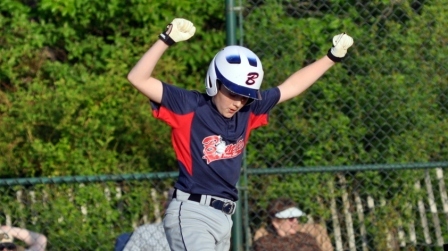 11-U Red’s three hole hitter, Jarrad Dittmer, has been pretty consistent all season. He leads his team in hits (18), average (.581), doubles (6), triples (1), home runs (1), RBI’s (12), OBP (.639) & Slugging (.935). The bottom line is, he is the MAN. Derek Thomas seems to be one of the more dominating pitchers in the league. Thomas is throwing complete games and having much success. His fastball is straight cheese as he paints the outside corner fanning and freezing up hitters. Thomas is also helping himself out when he pitches by hitting the ball well. 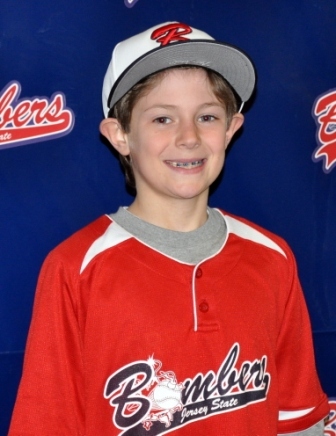 He is third on the team with a .409 batting average and a solid .500 on base percentage. Ryan Wainwright is second on the 11 Red in average (.500) and RBI’s (10). Wainwright is holding up strong on defense and coming up big on the mound holding opponents to just a few runs per game. “The ability to utilize Ryan at first, third, pitcher and catcher has helped us is so many ways defensively. He is fundamentally sound and I am glad to have him on my team”, said Coach Taylor. The first year 10-U Bombers are starting to come together. The offense is sparked by Ian, the Tazmanian Devil, Long who is currently leading the team in hits (17) AVG (.425) and RBI’s (14), what a stud. Chase Cooper, the leadoff man, is second in AVG (.421) and OBP (.542). 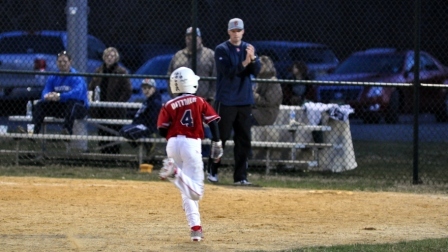 “I really like him in the lead-off spot and when he gets on, I know we are going to score runs,” said Coach Leadbeater. Jon Brown and Austin Angradi are both at the .400 mark. Brown has 5 RBI’s, 10 Walks and a .535 OBP. Angradi has 8 RBI’s, 9 walks and a .561 OBP. “We couldnt ask for more out of these two as of lately, we really hope they keep swinging it like they are,” said Coach Leadbeater. “I really like Jon Brown’s athletic ability, very flexibile, quick and coordinated. He is going to keep progressing and I see a strong future for him in baseball. I also see a lot of improvement in Angradi from when he first started coming to our facility in the fall, his swing is a world of difference and he has the ability to really do some damage in the middle of the line up if he gets his pitch.” said GM Roach. Evan Grzeskiewicz and Christian Overton are holding their own at the .303 mark. “Both of these players give everything they have every game to help the team win. 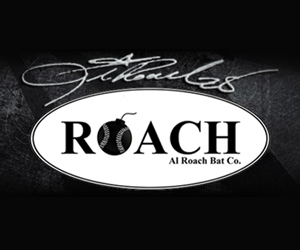 They both show great signs of coachability and are getting better and better every day.” Said GM Roach.